Reconstruction of complex defects of facial nerve (FN) after extensive cancer surgery requires individualized solutions. We describe the trifurcation technique as a modification of the combined approach on example of two patients with locally advanced parotid cancer. Due to perineural invasion, extensive resection of the FN from the mastoid segment to the peripheral branches was required. For reanimation of the upper face, a complex cervical plexus graft was sutured end-to-end to the mastoid segment of the FN trunk. The branches of the graft enabled reanimation of three peripheral temporal and zygomatic branches. The mandibular branch was sutured end-to-side to the hypoglossal nerve (hypoglossal–facial nerve transfer, HFNT). Additionally, the buccal branch was independently reanimated with ansa cervicalis. Facial reanimation was successful in both patients. Good resting tone and voluntary movement were achieved with a mild degree of synkinesis after 13 months. Patient 1 showed the Sunnybrook (SB) composite score 69 [76 (voluntary movement score) − 0 (resting symmetry score) − 7 (synkinesis score)]. In patient 2, the SB composite score was 76 (80 − 0 − 4, respectively). In this trifurcation approach, cervical cutaneous plexus provides a long complex nerve graft, which allows bridging the gap between proximal FN stump and several peripheral branches without great expenditure. 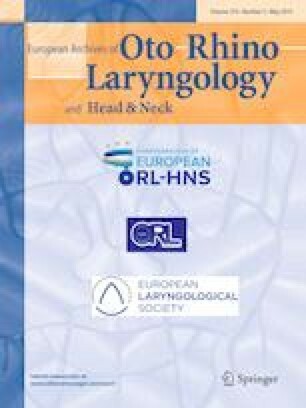 In combination with the HFNT and ansa cervicalis transfer, this procedure enables the facial reanimation with low grade of synkinesis. The online version of this article ( https://doi.org/10.1007/s00405-019-05418-4) contains supplementary material, which is available to authorized users. We thank Mr. Stephen Cass, MD, for reviewing the manuscript. All procedures performed in this study involving human participants were in accordance with the ethical standards of the national research committee and with the 1964 Helsinki Declaration and its later amendments or comparable ethical standards.